Sunday, I brewed my 2012 version of SheppyBrew's X-Mas Ale. 2009 had almond and vanilla extract with Cinnamon and cloves. It also was brewed with cherries. ABV was 5.7 and IBU were 32. 24 SRM. 2010 also contained cherries, but the special flavoring was Apple Pie Spice. ABV was around 8% with 22 IBU and 26 SRM. In 2011, the holiday flavor was Hazelnut. It had a 7.3% ABV. It contained 37 IBU with a 22 SRM. I still have bottles from all three batches to do a vertical tasting. This will be the last year I can do 2009, as I only have one bottle left. The 2012 version is almost exactly like the 2011 version. The only real difference between the two is that this year I am using peppermint extract to flavor the beer. 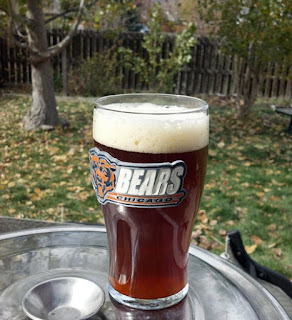 It should be around 7.5% ABV with 35 IBU and an SRM of 22. I have used peppermint in a beer before. Leprechaun Stout, created back when I still used Mr. Beer ingredients had a wonderful thin-mint character. I thought it was an awesome dessert beer. This year, I decided to try the peppermint again. The X-Mas base beer has less chocolate notes and more caramelly character, but I think the peppermint will come through similarly. I am thinking it should remind me of candy cane. So, early Sunday morning (before the sun was up) I mashed just over 15 pounds of grain at about 154 degrees. I let the mash go through church, and so it was converting for about 2.5 hours. 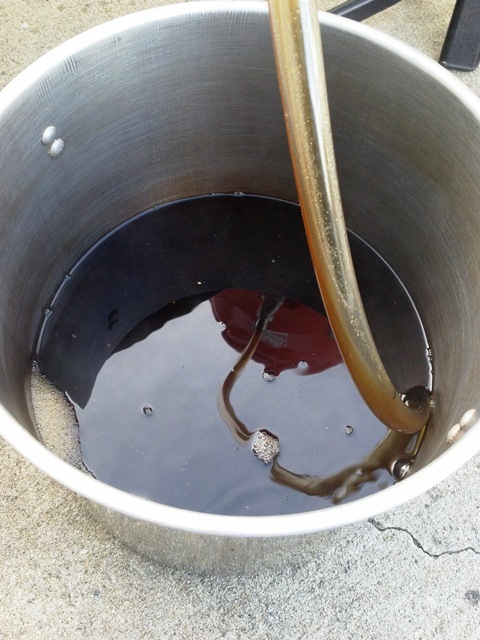 The wort came out dark, and I could smell lots of roasty chocolate aroma. My pre-boil gravity came out exactly where I wanted it. The boil went smoothly and I ended up with 5.5 gallons of wort in the fermentor with an OG of 1.074 (right where I had planned). I let the carboy sit in ice water for awhile to get pitching temperature down to 58 or so. 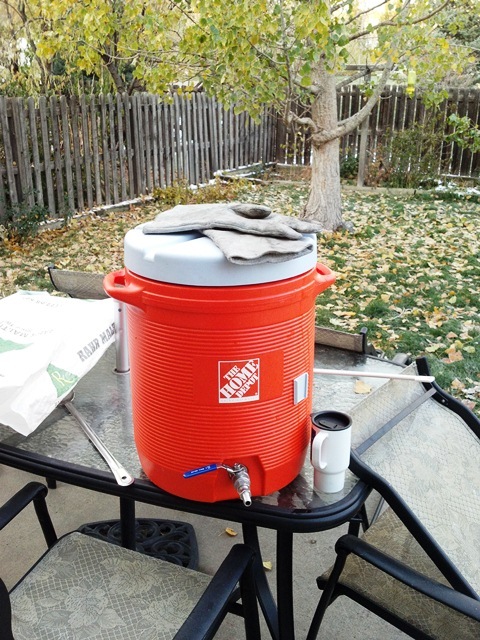 I had made a yeast starter which I pitched into the fermentor. Then, I let it sit at room temperature. By the next morning, I had VERY active fermentation at 66 degrees, and needed a blow-off tube. Since then, I've had to empty my blow-off container a couple times, and the fermentation continues to chug along with vigor. My plan is to rack to a secondary fermentor this weekend. I will add the peppermint at that time. Most likely, I will let the beer age a bit before I bottle it up. I am hoping to harvest the yeast from this batch to use in my next few beers. So, there we are. You can be sure I'll let you know how it tastes and how it compares to other vintages. Stay tuned. Bookmark this blog's X-Mas Ales label and check back regularly. 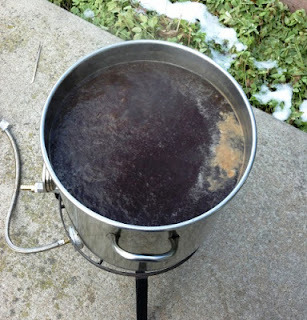 In the meantime, leave a comment and let me know if you have any special holiday beer brewing. For that matter, let me know if you are making a non-holiday beer. Not making beer, but planning my truffles and other Christmas treats. I'll be doing a turtle truffle this year.